Gustavo Victor Goler is a well-known santero. Had this statement been made in his native Argentina, people would have thought that he was a practitioner of Santeria — a syncretic faith that blends African religions and Catholicism. But a santero here in New Mexico, and only here, is a saint-maker and not necessarily a believer. In Goler’s case, though, he makes saints and also has a profound faith in them. The gorgeous altar built in his studio, ornamented with santos given to him by other artists, candles and pictures of deceased relatives and friends, attests to it. Goler grew up in a family of art conservators in Santa Fe and moved to Taos in 1988. He began by restoring religious images — replac­ing fingers, noses and attributes – but once he start­ed high school, Goler realized there was a long, rich history of people making santos in New Mexico. He devoted himself to the study of the saints and their iconography. When he made his own santos, he added a personal touch that later developed into his own distinctive style. At 23, with the encouragement of family mem­bers and gallery owners, he presented his work to the public for the first time … and he hasn’t stopped since. “I’ve been an artist and conservator for 24 years,” said Goler. His pieces have been exhibited, among other places, at the Smithsonian Institute, the National Hispanic Cultural Center in Albuquerque and the Harwood Museum. They can be found in museums, private collections, galleries and churches all over the country. Goler lectures, teaches and works with art col­lectors and museums. He has been on the board of the Harwood Museum and the National Hispanic Cultural Center and has shown his work at the Santa Fe Spanish Market for the past 21 years. In his studio, among unfinished pieces, tools and lithographs, he has an impressive collection of awards­— Best of Show, the Archbishop’s Award, the People’s Choice and many others. 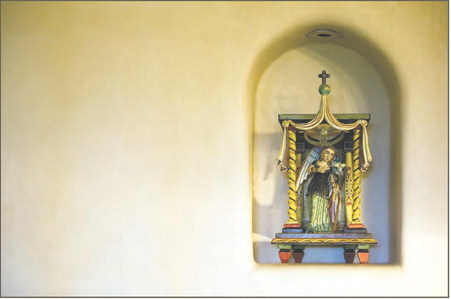 The santo art in New Mexico follows the old ­fashioned, traditional style. Due to isolation of the region and the lack of materials from Mexico, the 18th, 19th and early 20th century local artists used to crush their own pigments out of minerals and plants. They made varnish out of piñón sap, cut wood with axes and carved everything by hand. And how is a modern santo made? “For me, it’s a three-step process,” Goler said. Goler still makes his own varnish and gesso, and carves his pieces by hand, though he uses a few mod­ern tools like an electric chisel and a chain saw. He paints with watercolors, instead of making his own pigments, a long and time-consuming task. He creates bultos — three dimensional carvings — and wooden panels called retablos. Before making an image, Golers finds out as much as possible about the saint’s life and circumstances, and draws inspira­tion from them. An example of the first case is his bulto of Santa Cecilia, patron saint of musicians, playing an electric guitar. As for the second one, we have Santa Marta, the patron saint of housewives and cooks. “I portrayed her as a waitress, too,” said Goler. Besides an apron and a broom, she carries a tray of food. In New Mexico San Pascual Bailón usually presides over kitchens, but another patron saint of cooks is San Lorenzo. Goler’s San Lorenzo, stand­ing on a grill and being cooked by his own fire, wears a deacon habit and an apron decorated with green and red chile peppers. In one hand he holds a plate with chicken wings, bread and a steak the typical barbecue fare. In the other hand he has a skewer with a big chorizo. And then there is a bulto of Doña Sebastiana, a skeleton often depicted riding La Carreta de la Muerte (the Death Cart). 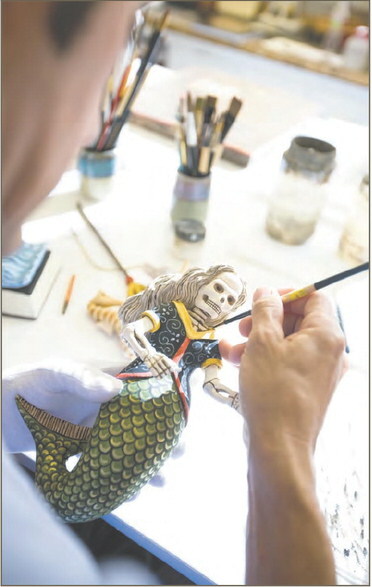 But she is a maritime Doña with a green mer­maid tail, flanked by two seahorses and brandishing a trident. “This is not your abuela’s Doña Sebastiana,” I commented. “Well, I prefer to experiment with contemporary ideas,” Goler said. The artist can be reached at (575) 758-9538. His website is http://www.victorgoler.com/.